I loved everything about this book from the cover to the age appropriate horror. This is the perfect horror start for ages 10-14. Josie, her mom and her sister are moving in with grandma but grandma has some rules. Never leave your window open after dark! No dolls are allowed in the house! Do not go near the house in the woods! They seem simple enough but when Josie meets a new friend named Vanessa who gives her sister a doll things start getting weird. Not only that but grandma seems further away than ever and that house in the woods is where Vanessa lives. Creepy yes but nothing over the top. 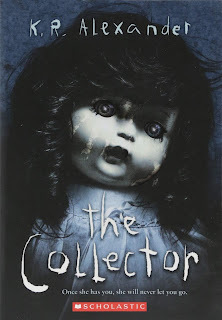 If I was a kid there is a scene where all the dolls in Vanessa's house are turned toward the wall which would have creeped me out..wait...as an adult that creeped me out but this is because K.R is a really good writer who is very descriptive. I could see the scene playing out. All in all...I think kids who love this genre will enjoy this book. Someone please make this a movie!